Nature Corners began in 2005 with a small factory and a few workers in the province of Prachinburi. Since its creation, the factory has expanded over an area of 40000 square meters (25 rai), employing over 200 workers, and can produce over 100 containers worth of goods annually. With our expertise in weaving that has built up over time, we are able to produce goods of various forms that suit each market and each client. In addition, we are able to custom design and manufacture furniture for each unique client for better compatibility with their function and lifestyle. 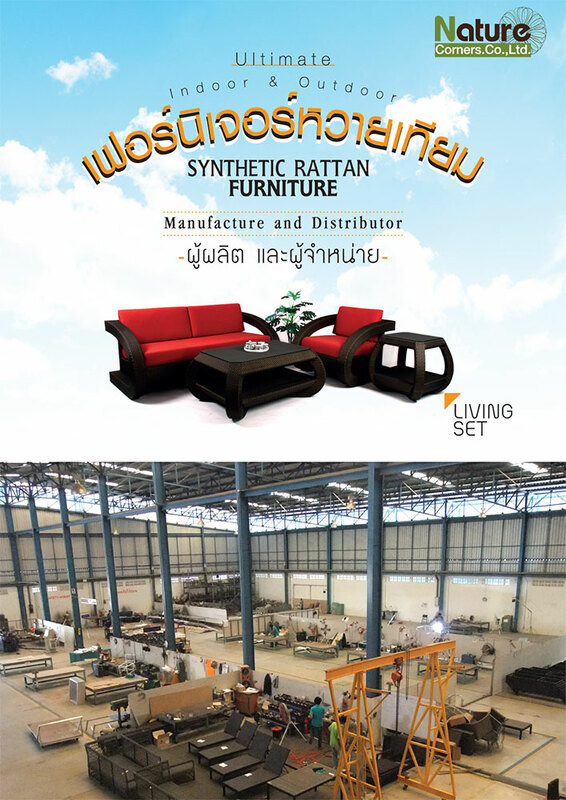 After the success of natural rattan furniture, we wanted to challenge ourselves through new, innovative materials for better living solutions – leading to the creation of synthetic rattan. Our synthetic rattan has many qualities that overbear natural rattan, including color, texture, ergonomics, flexibility, UV resistance, weather resistance, and environmental friendliness. The synthetic rattan weaved over a frame of various materials make beautiful furniture, popular in the foreign market. Every piece of furniture we make are based on a love of creation, in hopes that they become a sense of pride in the household, further endowing a client’s dream. From our constant forward thinking and doing, we are currently one of the top weaved furniture manufacturers and exporters, and a leader of furniture innovation in the nation.